Choose the most powerful Warlocks in the universe and wage a war to cleanse evil once and for all! 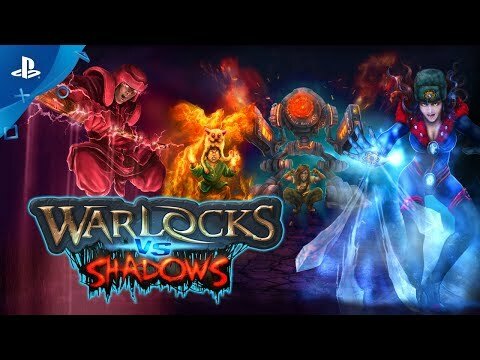 Warlocks vs Shadows is an intense 2D action RPG/brawler featuring 5 terrifying dimensions, 25+ epic stages and final boss levels, and dozens of enemies that will put your combat skills to the test. Call forth the most powerful Warlocks in the universe! Play the Campaign mode in single player or co-op, then fight in Deathmatch modes for up to 4 players, and see who can survive the ultimate test of action, reflexes and skill! Enter a gorgeous 2D world of vivid pixel graphics, hypnotic art design and brilliant music. Each character and the huge variety of enemies is gorgeously rendered: battle massive war machines that tower over the screen and fiendish monsters that blast you with a terrifying variety of attacks.